CHC Vintage is a vintage clothing and accessory subscription box. Choose between the Vintage Dress box, Vintage Tee and Accessory box, Vintage Lingerie box, or Vintage Outfit subscription box. The Products: One complete outfit consisting of a top and bottom (shorts, pants, or skirt) as well as one accessory that ties the whole look together. I find that my preferences are really listened to, as well. I don’t wear shorts or super short skirts and what I received this month (see below) is definitely a length that works for me. This is great for me. The skirt is so lightweight and comfortable, it’ll be great for summer, and the turtleneck (the card suggested tucking it in, though this is not something I usually do) will go with some pretty bold jewelry if I decide to make some to match. This seems work-appropriate, too, though I would probably want to build up my triceps muscles a bit before going sleeveless in public! This was the accessory for the month and I love it. I cannot even imagine how long it took to make this. It is in really good condition, though, and the zipper works well. If I want to go somewhere and not carry a huge bag, this is sufficient to fit a few essentials and the strap means that I won’t accidentally set it down somewhere (like I totally would with a clutch). Verdict: I didn’t know what to expect with the CHC Vintage Outfit subscription, basically just the pictures on their website. Although I did give some preferences for things I might like, I didn’t strongly oppose any options (except shorts and really short skirts). I said that I’d be happy to try outfits from different decades and I think this month’s selections absolutely worked for me, plus they are seasonally appropriate so I can start wearing them right away (I live in the South; we’re already having some days in the 70s). Can you still get this box if you subscribe today? No, every box is different. Value Breakdown: This box costs $150 for three months, so you are paying an average of $50 per month (which includes Priority Mail shipping). Check out all of our CHC Vintage reviews and find more great apparel subscriptions in the Women’s Clothing Subscription Box List! What do you think of the CHC Vintage Outfit subscription? How do subscribers rate CHC Vintage Outfit Box? 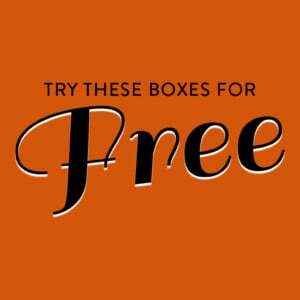 Do you subscribe to CHC Vintage Outfit Box? Add your rating now! Outfit looks great on you! Love that bag! Honestly my style is a combination of (1) Kohl’s clearance section (for work) or (2) men’s jeans and a cat t-shirt (for weekends). @Ragan – omg I am in love with that bag!!! I wish I could buy one. Actually the whole box is wonderful. I’d be thrilled with that selection. Can you tell us anymore about what you told them in your profile?? I don’t remember much about the profile (it’s been a few months since I filled it out), I gave sizes and indicated my weird measurements (hips and bust are XS and waist is like M or close to it). I most likely would’ve said that I don’t wear neutrals because I don’t (not complaining about the top here, you need a solid color with that skirt). Also I would’ve said I don’t wear shorts or short skirts. I do like bright colors and bold prints but the availability of those is going to vary by decade. There’s a good chance I asked for things that were work appropriate (I work in an office where it is loosely “business casual”). I said any decade was OK, thought it would be fun to show the range. What fabrics are the skirt and shirt made of? Can you request decades with this version of the sub? I don’t know, I’d say the skirt is cotton (not stretchy, lightweight) but no idea on the top; there wasn’t a fabric composition label (it was stretchy but that doesn’t necessarily narrow it down). You can request decades; I had said I was open to various ones which is why I’ve received different eras each month so far. Gorgeous! Love every bit of this. The whole ensemble is stunning on you. I think the shirt definitely should be tucked in for the vintage look. Really pretty outfit and I love, love, love that bag. This is great! And it looks fantastic on you. This is a tempting subscription!